Break out the Pumpkin Spice Lattes because September is here! 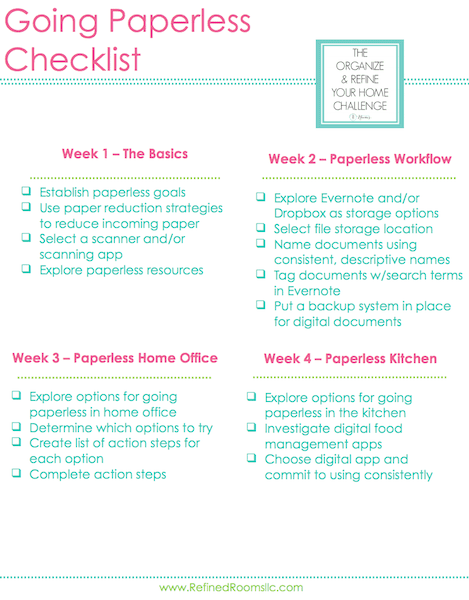 And with it comes a new area of focus for the Organize and Refine Your Home Challenge — Going paperless! During the first two weeks, we’re going to cover the basic things you need to know about reducing the amount of paper in your life. Then in the last 2 weeks of the challenge, we’ll focus on reducing paper in two key areas of your home: the office and the kitchen. Sound good? If paper clutter isn’t a problem for you, then pat yourself on the back because you are in the minority my friend! And congrats…because you get to skip this month’s Challenge assignments. If paper clutter IS a problem and you’re just not keen on the whole digital document thing, you may want to hop on over and check out the Paper Declutter Challenge series (which offers up tips and ideas for organizing all categories of physical papers). For the rest of you…let’s get this party started! Paper gets a bad rap in the organizing world. 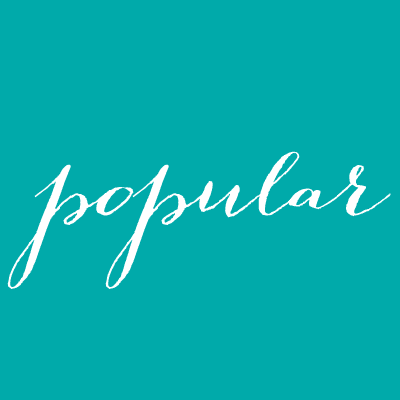 It was definitely the #1 issue that plagued my organizing clients (and it’s the #1 reason that people seek out the help of a professional organizer, go figure). 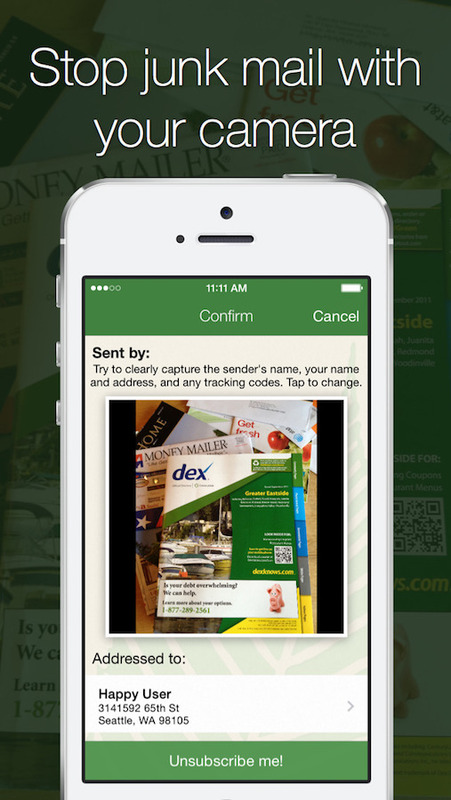 But should the goal of going paperless be to actually become paper-free? Let’s face it. Becoming paper-free is just not a realistic goal. As much as I’m all about eliminating paper from my life, I still consider myself a paper/digital hybrid girl. I still like to use printables for certain things (e.g., meal planning, my daily docket). And then there’s those types of papers that we really do need to keep, like original copies of vital documents. So instead of paperless, let’s go with the phrase “paper-less” from this point forward. Going paper-less essentially means that we’re becoming intentional about reducing the amount of paper in our home and in our life. 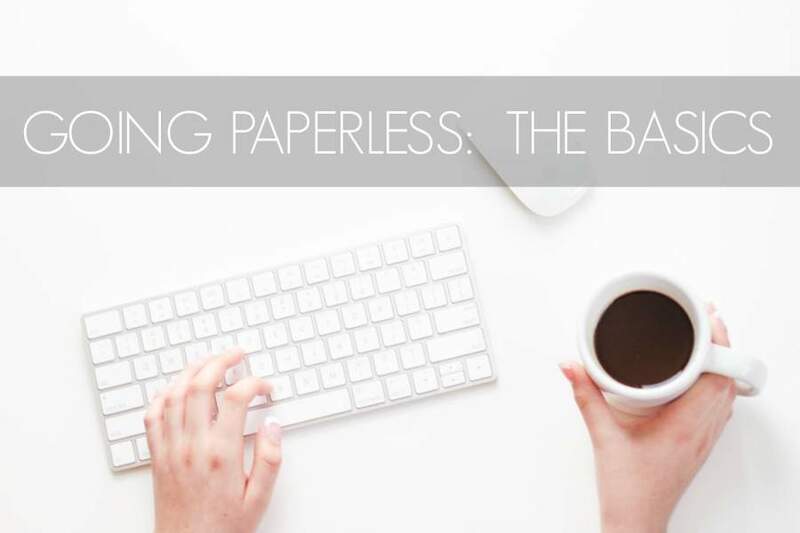 WHY DO YOU WANT TO GO PAPER-LESS? 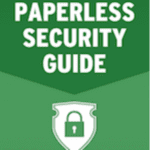 There are many reasons that people set out on a journey to go paper-less. For some, it’s about “going green” and reducing the number of trees they’re killing. For others, it’s about saving money. I’m sure you’ve noticed that ink, toner, and paper are not cheap! Of course, reducing the volume of paper clutter in the home is a huge benefit to going paper-less. But did you know that another common benefit is increased productivity? When documents are digitized (i.e., scanned), the information that’s contained within the documents can become searchable. What might take 30 minutes to find in a stack of documents can now be found in 5 seconds by using your computer’s search function. Just like with any other decluttering/organizing project, it’s important to get clear about your end goal for going paper-less. Where do you want to be at the end of this month relative to your current paper clutter situation? No matter what your specific goal might be, the first step to going paper-less is to reduce the amount of paper that’s currently coming into your home. Begin asking yourself, “what papers can I eliminate?” To help you answer this question, check out these tips for reducing household paper clutter. Once you’ve taken steps to reduce incoming paper, it’s time to take action on those existing papers in your home that you’ve made a conscious decision to eliminate. You’ve got two options when it comes to eliminating them: 1) trash them or 2) transform them into digital documents that will live in a “digital file cabinet”. We’ll talk about organizing and safeguarding documents as part of next week’s assignment. But for today, let’s focus on step #1. What tools you use to digitize your paper really depends on the size of your paper piles. If the volume of incoming papers is fairly manageable and your paper backlog can be classified as mild to moderate, then you might be just fine using a flatbed scanner or your all-in-one printer. OCR capability (the technology that makes scanned PDF files searchable). If you attempt to scan large volumes of paper using anything but a dedicated document scanner, you’ll soon become annoyed at how inefficient the process is. Having the right tool for the job will remove a huge barrier to getting a large scanning project completed. In fact, I’ll go as far as to say that I actually enjoy scanning documents with my document scanner! 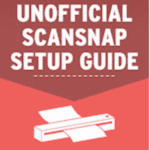 So which document scanner do I use? I’m a huge fan of my Fujitzu S1300i personal scanner. 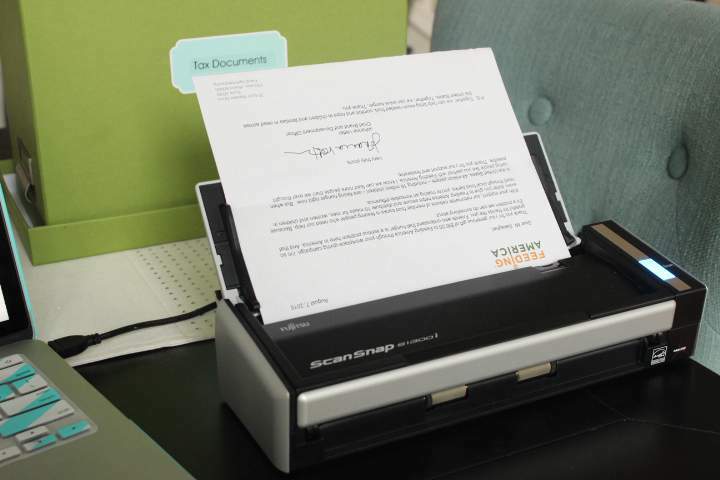 It has a 15 page automatic document feeder, and can scan in either single-or double-sided mode. It’s portable and works with both Macs and PCs (we have both in our household). I’d love for you to share your goals for going paper-less via Instagram (use the hashtag #OrganizeandRefineChallenge) and/or share it in the comments below! This is a great article. 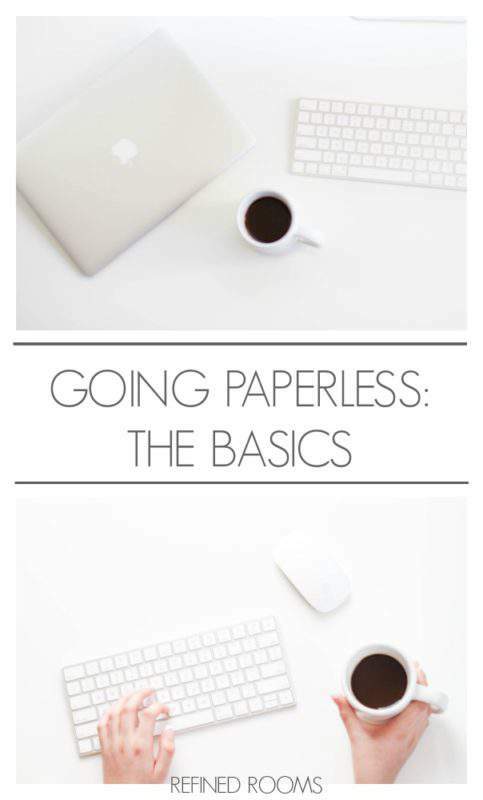 Never thought about all of things we need to do in order to go paperless. Thanks for sharing at Funtastic Friday. There are definitely some “moving parts” involved. Once acquire all of your tools and get your system in place, it really becomes 2nd nature after that ! 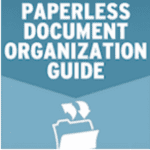 This is a wonderful collection of resources for those who want to go paperless. Thank you for sharing this wealth of information. These are some great. Didn’t realize there were so many different apps for scanning. Thanks for sharing at our Tips & Tricks Link Party! Hey Jessica! Thanks for stopping by! Great assessment of what each of us wants our paperless solution to be! Thanks for stopping by Ellen! I’m starting my list to Santa early this year and a personal scanner will be on it. Thanks for sharing with us at Merry Monday. Shirley, you will NOT be sorry!! I love that you included apps for scanning. I used one called “Tiny Scanner” for iOS. It synced with my Dropbox account and it was so easy. This is how I was able to go paperless with my recipes. Woohoo. 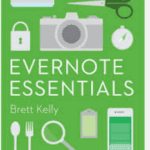 This is a great post Natalie and FULL of resources! This is on my personal agenda for this winter so I am saving and sharing! 🙂 Thank you!